A Refugee and Asylum Seeker Oral Health Recall Tool has been developed for use in Victorian public dental services. This report details the process and findings of the development and piloting of this tool. The project was funded by Dental Health Services Victoria (DHSV) and conducted over a five-month period from November 2016 to April 2017 by the Victorian Refugee Health Network. 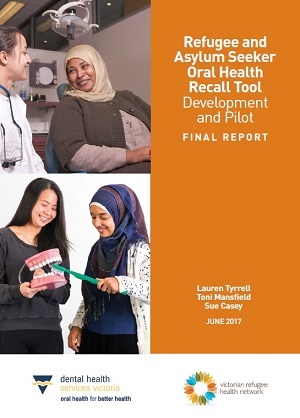 Tyrrell, L., Mansfield, T. & Casey, S., 2017, Refugee and Asylum Seeker Oral Health Recall Tool – Development and Pilot: Final Report, Victorian Refugee Health Network: Melbourne.